As a result of the risk of DILI caused by OFEV, Health Canada has stated that physicians must closely monitor their patients taking the medication and that it will be “working with the manufacturer to update the Canadian Product Monograph with this safety information”. The Recall and Safety Alert goes on to indicate that “Managing marketed health product-related side effects depends on healthcare professionals and consumers reporting them. Any case of drug-induced liver injury (DILI) or other serious or unexpected side effects in patients receiving OFEV should be reported to Boehringer Ingelheim (Canada) Ltd. or to Health Canada”. Read the full Health Canada MedEffect Notice. This is the second product safety notice released by Health Canada relating to liver damage concerns in the last two months. On November 15, 2017, Health Canada published a Safety Summary Review on natural health products containing Green Tea Extract (“GTE”). According to the notice, “Health Canada’s review concluded that there may be a link between the use of green tea extract and a risk of rare and unpredictable liver injury”. Health Canada reviewed information received from around the world, including Canadian data indicating that between 2006 and 2016, there were 11 cases of “suspected” liver injury associated with products containing GTE. Only 2 of the 11 cases had enough information to show that the liver injury was “potentially” related to GTE containing products. This “rare and unpredictable risk” of liver damage has prompted Health Canada to require manufacturers of products containing GTE to put stronger warnings on their labels and is restricting use of products containing GTE to persons over 18 years old. Health Canada will also be monitoring safety information of products containing the extract rather than relying on reporting by healthcare professionals and the general public. Read the full Health Canada Summary Safety Review. In its proposed new regulations on self-care products, Health Canada claims that it wants to apply the same penalties and powers to natural health products as it does to chemical drugs, effectively creating a belief that Canadians need more protection from natural health products. 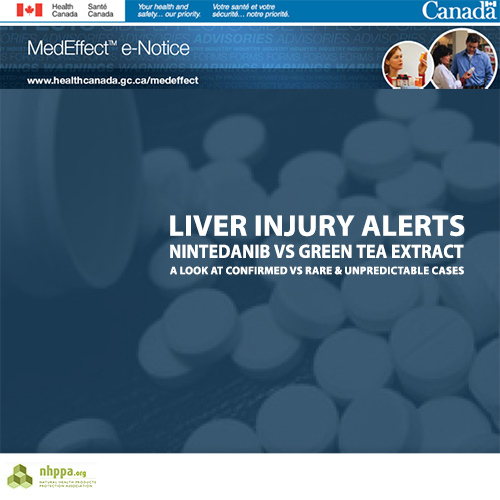 One cannot help but notice the contrast in government actions in response to the confirmed risks of liver damage from Nintedanib vs the rare and unpredictable risk from Green Tea Extract.